The needs of military families are the same worldwide, and Marine Corps Community Services Okinawa is taking a lead role in providing timely information to Navy and Marine Corps dependents on Okinawa. The MCCS Family Readiness Day Expo on Saturday draws dozens of families from seasoned veterans of military moves to those new to the military community for a day of interaction between them and the support agencies tasked with serving them. The Expo, an annual event, takes place 10 a.m. to 4 p.m. at the Camp Foster Field House. 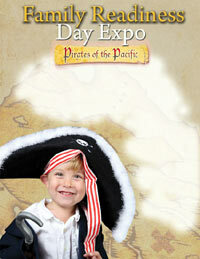 This year, attendees will have the opportunity to compete in a Pirate Costume Contest. This costume contest is open to all ages, whether you are a baby nibbling on a teething ring or the parent holding that baby. The only requirement is that participants must be dressed as pirates. Costumes will be judged by a panel of judges at 2:45 p.m., with prizes awarded to the best male and costumes in various age categories; winners in the ages 0-5 category will receive a $100 gift certificate, and winners in the 6 & up category will receive a bicycle. The Family Readiness Day Expo features local elementary schools participating in the Christmas Banner Contest. Each participating elementary school will submit one banner, and the banners will be judged at 10:30 a.m. by a panel based on established criteria provided to each school. The winning school will receive a free ice-cream party for the entire school. Each banner will be displayed on stage throughout the Expo so that attendees will have the opportunity to view them. Prize drawings will be an hourly occurrence at the Family Readiness Day Expo. Each person who enters the Foster Field House will receive one ticket that is automatically entered into the drawing for hourly prize giveaways. If you want to increase your chance of winning a prize, donate a toy at the Toys for Tots booth and receive an extra ticket for the prize drawing. Sponsored items include a trip for four to Hawaii courtesy of Omega World Travel and United Airlines, and a trip for four to Tokyo Disney courtesy of MCCS Tours Plus. Among other prize highlights are pirate treasure chests filled with toys, sponsored in part by Mattel. Another attention-grabbing attraction at the Family Readiness Day Expo is the variety of performers booked to entertain the entire family. Various schools will be represented including the Kubasaki High School JROTC cheerleaders and Eisa dancers, and the Lester Middle School Choir. Also performing will be the Pacific Okinawa Players. The MCB Camp Butler Fire Department will be on hand with its fire truck, Marine & Family Services will be dazzling families with calligraphy, and the Lifelong Learning Center will keep kids entertained with cool crafts. The 2007 Family Readiness Day Expo will also have a free Kiddie Land that includes face-painting, bouncies, and more. Food vendors will be available throughout the day, and there will be free ice cream available for all attendees. Last but not least, kids will have the photo opportunity of a lifetime by having their picture taken while walking the plank of a pirate ship, or standing alongside a pirate with a parrot perched on his or her shoulder. For more information about the 2007 Family Readiness Expo, contact Marine Corps Family Team Building at 645-3689.